Two lovers blamed for starting a war. Three women who must survive a siege. There would be few people who haven’t heard of the famous siege of Troy. The tales of the heroics of Achilles, Hector, Agamemnon and Menelaus have been handed down for thousands of years. So too the infamy of the lovers, Helen and Paris, who sparked the war. There was another siege that lasted a decade, though. A tale of conflict known only to those who are aware of an obscure episode in Roman history. It was a war fought between Rome and the Etruscan city of Veii. However, unlike the Greeks who sailed across the sea to battle the Trojans, the Romans only needed to venture twelve miles across the Tiber River to attack the Veientanes. In fact, despite being close neighbors, the enemies were from opposing worlds, so different were their customs and beliefs. For the nascent Republican Rome was austere and insular compared to the sophisticated Etruscans with their vast trading empire. And while Roman women were second class citizens, Etruscan women were granted independence, education and sexual freedom. Only a strip of water separated Rome and Veii but the distance between them was measured in more than miles. This conflict is the genesis for my series, Tales of Ancient Rome. 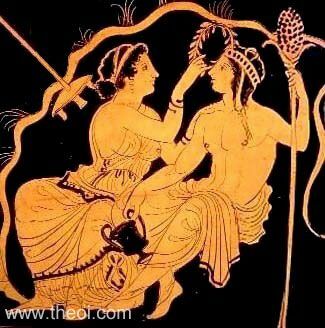 And just like the Iliad, the fates of my characters are entwined around those of two lovers who are blamed for starting the war: the Roman treaty bride, Caecilia, who comes to love an enemy nobleman, Vel Mastarna, whom she was forced to marry in The Wedding Shroud, but to whom she returns in the sequel, The Golden Dice. 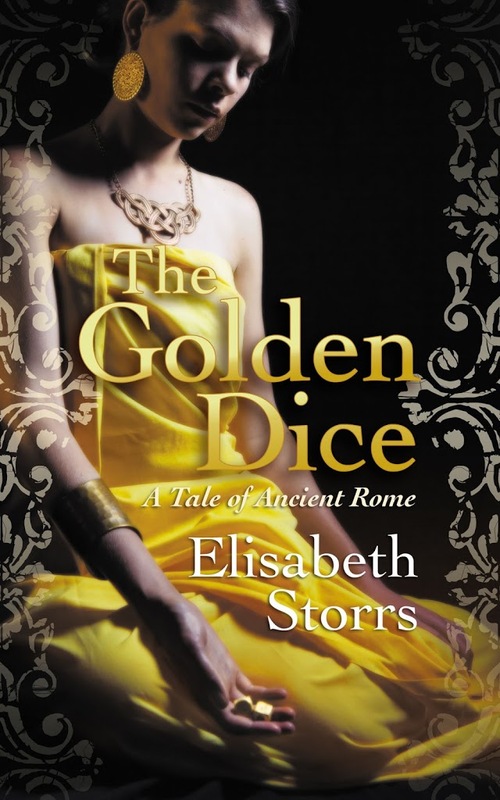 The Golden Dicecontinues Caecilia’s journey, however, I’m sure those readers who open the pages of the sequel first will have no problem in following the story so far. 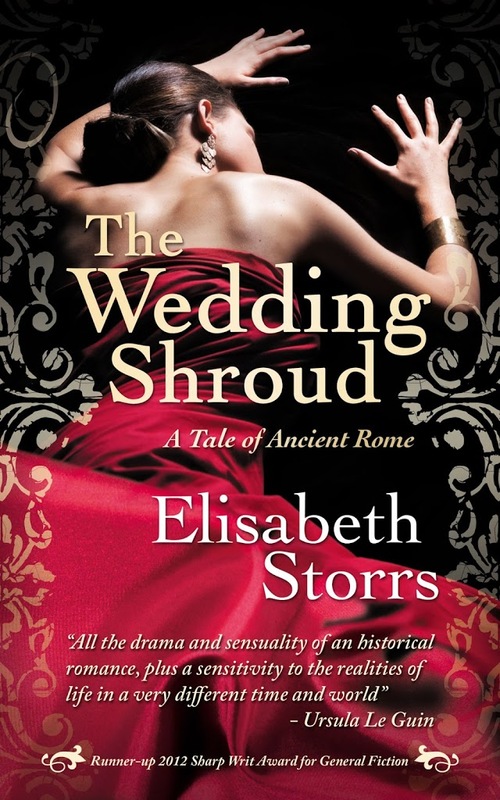 This is because the book is set seven years after the end of The Wedding Shroud and poses an entirely different set of dilemmas for Caecilia who is now the mother of three sons. I have also introduced two other strong female characters: Pinna, a Roman tomb whore, and Semni, a young Etruscan artisan, who becomes a servant in the House of Mastarna. The siege of Veii was chronicled by various Roman and Greek historians living centuries after the event. Each commentator tells the story from the viewpoint of the Romans rather than their foe. There is no extant literature written by the Etruscans, and so, unless archaeologists uncover such treasure, we will never know the Etruscans’ side of the conflict. The sources are also silent as to how women survived throughout such campaigns. In The Golden Dice, I have attempted to recount both sides of the war through the eyes of my three female leads. By following their paths, the reader will not only learn about the battles fought by the warriors these women love, but also understand the trials they face in order to protect themselves and all those dear to them. I hope readers will enjoy learning Pinna’s tale – a whore who services men in the cemeteries of Rome. A chance meeting with Caecilia’s cousin, Marcus, and his friend, Drusus, leads to an opportunity to blackmail them and escape the slums to travel as a concubine in the Republican army. And it is there that she encounters, and becomes infatuated by, Marcus Furius Camillus, Rome’s greatest general. Her efforts at coercion go awry, though, when she must decide whether to place loyalty above love. Semni, a young artisan who dreams of fame, finds her plans ruined when she is required to produce earthenware for the army instead of fine red figured vases. Ejected by her husband into the streets due to her promiscuity, she seeks refuge in the House of Mastarna. There she learns of schemes that will threaten Caecilia’s children, and is challenged to finally take responsibility for her own actions if she is to gain the love of Arruns, the Phoenician bodyguard. The Etruscans particularly loved the legends of the Iliad. Their art is dense with images of Greek and Trojan heroes. This resonated with me when imagining the story of Caecilia and Mastarna, and the war that rages around them. Although these lovers are reunited in The Golden Dice, their happiness and safety is threatened. For Caecilia knows that should ever Veii fall, she will be punished as a traitoress by Rome. She also fears that the Veientanes view her as an enemy, too. Her plight makes her question the very essence of her heritage, and forces her to make a decision as to whether she wants to see Rome destroyed. The Golden Dice is now available as an ebook on Amazon and other retailers here. In celebration of its release I am offering a chance to win a free digital copy if you subscribe to my newsletter and answer three questions about an excerpt of the book which you can download here. I hope you will enjoy visiting the fantastic world of the Etruscans in this novel of love, war, loyalty and corruption. Please feel free to connect with me on Facebook and Twitter. I’d love to hear from you.